We hope the following article by Spyros Peter Goudas provides you with a little warmth on this cold winter day. With the anticipation of over 25 cm of snow, the thought of Canada Geese and their return in the spring is something to hope for. Mr. Spyros Peter Goudas has given the rights to publish this article to The Jamaican Express, Indo Caribbean World, The Toronto Star, Evdomada Newspapers, and a few others. Introduction: During the early weeks of winter Canadians are very acquainted with that traditional quacking sound coming from above followed by a flock of birds in a somewhat V-formation flying south. This is the migration of the CANADA GEESE to warmer ground in the south. They usually return in early spring. During the early spring months, I discovered some Canada Geese wandering around the driveway of the factory. It seemed a bit odd to me. My presence did not seem to disturb them; they were apparently looking for some food. I thought it would be a good idea to give them a piece of my sandwich which I had prepared from home. Oh what a treat it was for them! They really enjoyed that croissant. They disappeared for a while only to return with the rest of the family, about 20 of them. Being an animal lover, I began observing them. Obviously, I began purchasing extra croissants for them too. I heard that in certain municipalities they prefer that you do not feed them. I am quite aware of the controversy. I thought that it was a temporary thing. Maybe they were lost or maybe it was a one time visit. However, I was sitting in my office one day working on my computer when I heard a funny noise at my window ? like someone knocking. When I looked outside, I saw a couple of Canada Geese. They had the nerve, guts and the audacity to knock at my window and look at me right in the eye. I tried to tell them to go away by signaling them out, but they continued knocking at the window. I went outside and tried to tell them to go away. Maybe being Canada Geese, they understand perfect English; they did not understand my Greek-Canadian accent because they continued looking at me. Obviously, they did not come to say hello, or to see what I was doing. Neither were they interested in how the business was progressing. They communicated that they were hungry. I checked the office refrigerator and found a few slices of bread and proceeded outside. I walked into the parking lot. To my surprise there was a whole flock of geese. It appeared that the geese had brought the whole family and close relatives to meet me. I sat down on the sidewalk with the food in my hand and watched them move with their special strides of whole body movement. Oh what an experience this was! I even got to know them by name. One had a deficiency in the leg and was limping. He told me his name was Limping John. Another one had a few feathers missing from the tail. His name was Jimmy Missing Feather. And the third one told me he had barely escaped death while down south flying through some States where they allow hunting. Needless to say, he had quite a few feathers missing from his wings and his nickname was Wingless Joe. How funny it is when they are flying above people think they all look alike. But when they get close to you, you notice the subtle differences among them. I left them there, but I told them I would be back sometime since I was quite busy that day. They seemed to observe the type and colour of my car as I was driving away by making some quack, quack noises among themselves. Apparently, telling each other to be on the look out for my next appearance. The next day, half-way down the street, I noticed that they were on the edge of the rooftops of the other factories. I remembered I did not have any food for them so I turned around and proceeded to my favourite bakery. With the geese very much on my mind, when the cashier enquired as to what I needed, I responded wha, wha, She in turn responded, I beg your pardon. I then indicated that I needed a couple of sliced loaves of bread. Upon my return, I cut these slices into small pieces and threw them at the side of the road. To my surprise there were two families instead of one, around 40 of them. This is when I realized that each family consisted of about 20 geese. The next day, they were again perched on the roof awaiting my arrival. Since I was not prepared for this and had not purchased any bread, I spread rice on the grass area, and to my surprise, they all seemed to enjoy it very much. At the end of their dinner they let me know that they had heard about the quality of Mr. Goudas Rice down south and they really, really, really enjoyed every grain. (Seriously, there was not a rice grain left anywhere). They began to honk ? wha wha wha ?. In human language, they were telling me (We had a nice rice day today). The next day, I gave them a different variety of rice and they enjoyed it very much too. As summer approached, the staff and I enjoyed eating outdoors and the geese became quite familiar with our presence and we enjoyed theirs. By that time there were 6 to 7 families of Canada Geese resident at our location. As everyone is aware, they go potty everywhere. Therefore, we made sure that someone always washed the area. The traffic during the daytime is very busy; and obviously for some reason or another they do not care. They do know that humans can only walk or run, or the worst case scenario, they drive. However, the geese know that they can fly, which is a very big plus, and if you bother them too much they can make a quick turn above your head, and, with great accuracy, they can make a special deposit right on your head. Nevertheless, I started learning more about their behaviour through the Internet; yet there is no information on the websites as to how intelligent these birds are. As I continued to observe them, I needed more and more food. It so happened that a friend of mine, Pasquale D,Aversa passed away. I wrote a very nice article about his life and when I visited the Bakery his children asked me what they could do for me for such a nice gesture. I mentioned the need for 1 or 2 day-old bread loafs, buns, etc. I was therefore privileged to be able at any time I had a need, to simply go there and fill up a few bags of day-old bread. And as I said earlier on, these geese have become familiar with my vehicle and actually perch themselves on the roof-tops of the buildings en route to my factory awaiting my arrival. I spent more than one hour per day communicating with them. I even learned to make some of their wha wha sounds. I also observed that they communicated only with me. A few things surprise me about the intelligence of these birds. Just at sundown, they prepare for departure?. One of the geese proceeds to the centre of the square, while the other geese all flap their wings to ensure that there is adequate wing-span, i.e. distance between each other. They all face in one direction. At one point, the lead goose, apparently the leader, gives a signal, and all of the geese instantly, within a fraction of a second, make a 180-degree turn, all facing in the opposite direction, and stand very still, almost breathless, and do not make a single sound, whatsoever. The leader of the particular group that is about to depart, seems to start calling each by name, for instance: Limping John. Then Limping John responds, wha, similar to an army roll-call, when the sergeant shouts a particular name and the private responds, wha - present, sir. After ensuring that everyone is accounted for, the leader gives the signal for departure and the group of 20 takes off instantly. A few seconds later, the very same manoeuvres are performed by the next leader and that group takes flight. It is a fascinating sight to observe each and every group take off with such precision. Some unfortunate birds may be missing from the group because they may have ended up on the dinner table as a BBQ to some avid hunter. It is important to note that dogs and cats scare them away. Regardless of how preoccupied they are eating, there are always 1 or 2 geese on guard duty. My beloved pet, Koukla, spent many hours alone indoors during the daytime because her presence scared them away. She did let me know of her displeasure by constantly barking. I had a wonderful summer with my Canada Geese, one of the best I have ever had. I was never alone or lonely! Yet, similar to stories in Greek Mythology with the dual masks, representing comedy and tragedy; all good things come to an end. In this situation, one Sunday afternoon, the third week in November, I ended up with at least 25 families, approximately 500 birds, in the courtyard. They must have had a general meeting and a global positioning system (GPS) for them all to be able to find my location. To some, this could have been a scary moment, but to me it was a beautiful sight to behold. I walked freely amongst them with food in my hand. They had a wonderful time. Finally, at the end of the day, they all gathered in the courtyard and made their preparations for departure much more thoroughly than any other night. Suddenly, they changed their pattern of group take-off. After their usual roll-call, they ALL took flight simultaneously. and flew back towards me. I outstretched my fingers and hands towards the sky. It seemed like they were only a few feet above my head. summer they spent in my company. At that moment, tears filled my eyes. of being reunited with them next year! The article has already been published in the December 23, 2007, issue of The Evdomada Newspaper. The editor, Mr. Basilis Sklavos conveyed to Mr. Goudas that he received telephone calls and e-mails from the community telling him it was the best article ever published in his newspaper. On January 9, 2008, The Indo Caribbean World also published the article as part of their 25th Anniversary celebration. I live in an area that prides itself as being a centre for lake shore recreation and it is if you own a property on the beach or have a boat with access to the lake. 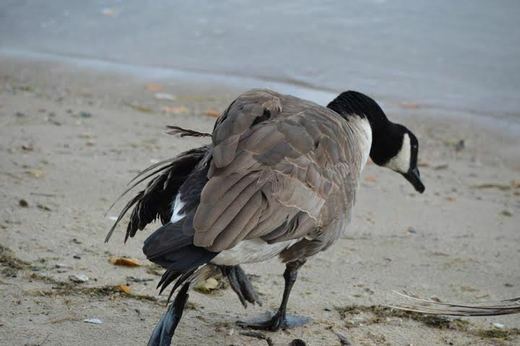 Every utopia has its dark side and for the Town of Lakeshore it is the ``goose problem.`` In other regions of Canada considered `less civilized,` citizens call out fire trucks to rescue migratory birds and other animals. In Lakeshore, Ontario, there is a By-Law instructing landowners on methods to destroy bird habitat. Rather than rant about the irrational beliefs of humans towards geese, I offer this true ongoing narrative of geese that have managed to overcome local attitudes that includes the unfinished fortunes of Bert and Ernie. 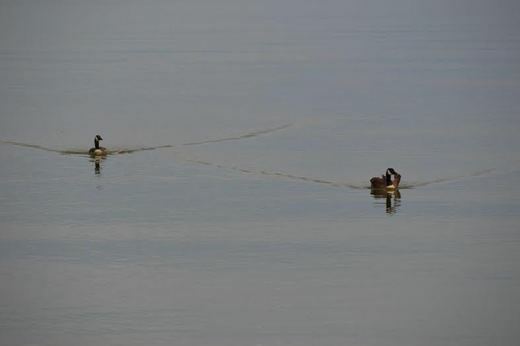 The identity of some of the geese in this story and their apparent relationship with each other is assisted by the bird banding of the Jack Miner Bird Sanctuary. The work of Jack Miner is world renowned and has revealed migratory behavior that isn't fully understood 100 years later. Geese have a complex social structure and it would be difficult to follow any one goose without these identity bracelets. 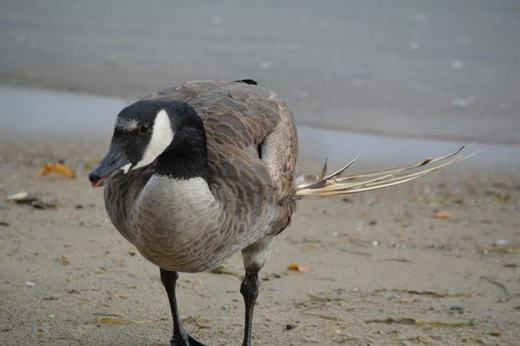 Back at the end of July, a goose banded as 101761 showed up with an injured leg on the beach where I live. This injury prevented "761" from getting up enough speed to lift off the water rendering him flightless. Being flightless is a seasonal condition endured by geese when they moult however 761 was unable to put any weight on his injured leg making him an easy target for predators. 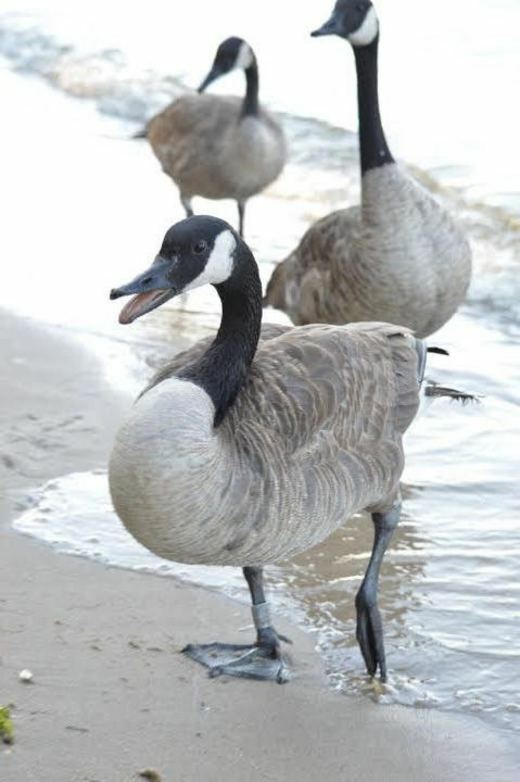 Geese have a command structure and prior to his injury, 761 was observed as one of the leaders of a mixed group of geese. It is possible that 761 was injured in a lost leadership struggle, or perhaps protecting other geese against predators, or perhaps he had a difficult landing. 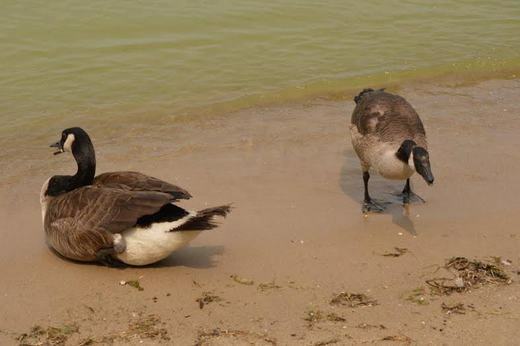 There are many ways geese get injured. 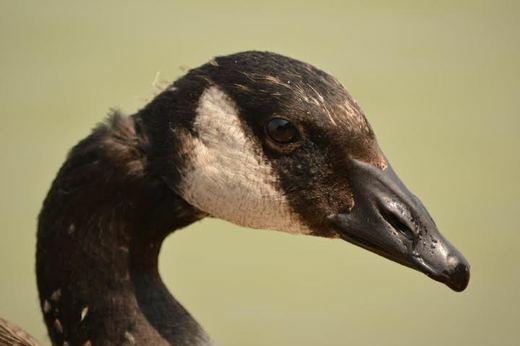 In late July, the numerous family groups (gaggles) have joined up, creating larger flocks. By this time, the moult was over and the leaders from amongst the older birds are coaching the young birds into practicing their flight skills. Now flightless, 761 has been left to fend for himself. Pictures speak a thousand words. In the picture below, you will notice the way 761 is not using his left leg to swim. He is unable to spread the webs on his left foot. It is a wonder he isn't paddling around in circles. In the above picture, 761 is calling after the flock which has just flown off and deserted him. The birds in that day's extended flock are in flight training and don't have time for him. 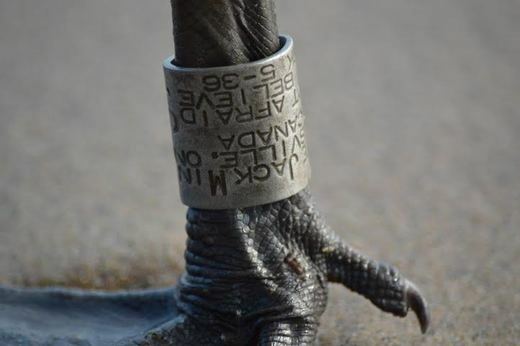 Below is a close-up of the Jack Miner bird band which is the reason we can identify him. 761 is not totally alone. 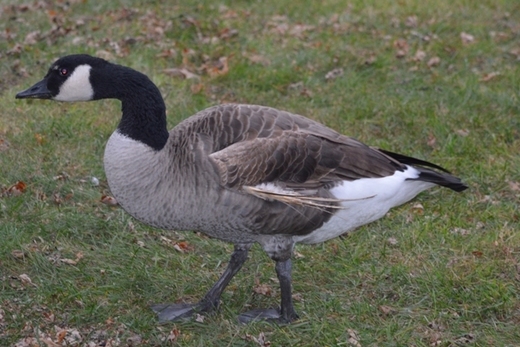 His sidekick is a healthy looking first year bird, which, like most geese, is not banded. For ease of reference, this bird has been named Sam. In late July, gaggles are still visible within the larger flock. The maturity of the young birds this year varies in ages by approximately three weeks. At this stage, some of the young birds are slightly larger and some look more like adults. Groups of young birds with adult pairs appear as single families within the larger flock. 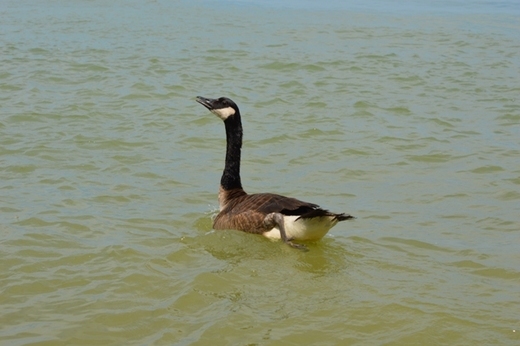 Young birds often move between the family groups as though the geese have a system of daycare. The combined families utilize multiple lookouts and are organized with a recognizable, although fluid leadership. Flock leaders will push out other adult birds for lookouts and will punish lookouts that appear to be napping. Sam is on the outside of every group. Every other goose on the beach seemed to take a run at him. The feathers on the back of his head show that Sam is "hen-pecked." The only visible difference between Sam and every other young bird is that Sam seems to have a slightly thicker neck as well as a slightly different shape to his beak. It is interesting to speculate as to whether it is Sam's choice to stay with 761 or whether Sam has been delegated this duty by the flock. Perhaps Sam is not well and the presence of an injured bird jeopardizes the entire flock. The complexity of the social structure of geese should not be underestimated. The picture below is an example of the aggression of a group of geese towards 761 and Sam. You will note that the bird leading this gang has its neck bent low and is hissing. The immature birds are lending support. These birds are more concerned with separating 761 and Sam from the rest of the flock than they are to the presence of persons on the beach. After the reprimand, 761 and Sam are left on the beach together and alone. 761 is honking in displeasure at being left on the beach. The efforts to exclude 761 from the flock may be seen in his chewed tail feathers. The last picture of 761 was taken on August 17, 2014 when he was with a small group including his old buddy 101747. I have been on the lookout for them since. It is possible that 761 recovered from his leg injury and can now fly. A good sign is that his band number has not been posted on the Recovery History page of the Jack Miner website. For those unfamiliar with bird banding, a recovered bird band is usually the obituary column although live sightings are now being posted. You will note that 761 was looking feisty in this picture and was again the leader of this small group who were voicing their displeasure at company on the beach. 761's foot had still not recovered. You are probably wondering what this has to do with a pair of geese named Bert and Ernie? On October 6, 2014, two geese were seen steaming past the water wall. That was odd for this time of year as the geese are grouping together and preparing to migrate. The geese are generally in larger numbers. The geese are moving from the lake at sunrise to the nearby fields to feed, returning back to the lake in the late afternoon. Thinking that 761 and Sam had returned after 7 weeks, I headed to the water wall with the camera. What happened next was appaling! These poor geese exited the water with badly damaged wings. Each was injured on the left side. Both will never fly again. It wasn't 761. Meet Bert and Ernie. It is difficult to guess what caused these injuries. The pictures disclose no open wounds although the wings look as if they have been shot through. Hunting on the lake is easily observed and all of the local hunters seem to follow the rules. These birds would not have made it back to the lake if they had been shot anywhere else. The possibilities are endless and include dogs or perhaps an eagle. Pictures of the injured birds were emailed to Erie Wildlife Rescue and Jack Miner. Both promptly replied. 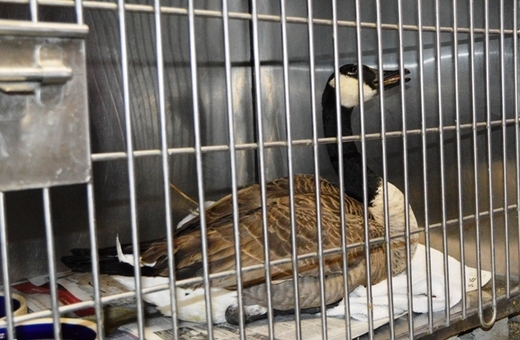 EWR suggested using a long handled fishing net to drive the geese away from the water, box them up and bring them in. Jack Miner said they could assist with the recuperation of the birds as they are a sanctuary for recovery. Our bird feeders had been put away for the summer months. On day 1, Bert and Ernie only received pieces of dry brown bread as that was all there was. The bird feeding policy changed when the injured geese turned up on the beach the second day. Bert and Ernie were starving and we had obtained a mixed seed that included corn for them. As the seed was put out on the beach and Bert and Ernie were eating, an immature bald eagle flew by. That was the second time an eagle was observed flying past the beach that day. The eagles know that Bert and Ernie are easy pickings as they are injured. Bert and Ernie know they could be dinner. Later that afternoon, a small group of five geese had appeared on the beach and they seemed to have rallied around the injured birds. Some would say that to suggest that this small flock of geese had turned up as support for Bert and Ernie is attributing human traits to the geese. These geese may have been merely opportunists for the grain. What can be said with certainty is that no geese have tolerated anyone with them on the beach since the hunting season opened this September. In addition, two guard geese had taken up positions on the water wall. This flock didn't retreat when I climbed over the water wall. These birds were there to help. As day 2 went on, the circumstances of the cooperation between the geese became even more difficult to ignore. Bert showed up at the back porch looking in the lakeside window. This had been the location of the winter bird feeders and this is where the geese had eaten the seed spillage in the spring. Bert is the larger and more disabled of the two injured birds. Bert can't fly and he couldn't have got off the beach by jumping the water wall. It was apparent that Bert knew his way up off the beach through the neighbor's back garden. There can be no doubt that Bert had been there before and that he expected to find food. Grain was placed on the back walk for Bert. Bert ate some of the seed and then left. Several minutes later, Bert returned with Ernie. Ernie is the smaller and shier of the two and extremely nervous. Bert had led Ernie on the trail for food. Bert could have left Ernie on the beach. Bert could have eaten all the food without Ernie yet Bert seemed to have saved some food for Ernie. Again, some would say that it is a coincidence, that geese aren't that clever, that geese don't share, or that geese lack the empathy to assist other injured birds. A lookout goose appeared while Bert and Ernie were feeding. Geese in a group don't usually all feed at once. In a flock, there is always lookout geese at the points. The uninjured goose had flown in and stood by guarding the approaches while Bert and Ernie ate. This guard goose only fed when Bert and Ernie left to return to the beach as dusk approached. This goose could have easily dominated the injured birds for the food. Instead it had acted as lookout and allowed Bert and Ernie to eat while it watched their backs. These birds can't survive the winter. The thought is to familiarize Bert and Ernie with people being on the beach, capture them and deliver them to the Erie Wildlife Rescue. Perhaps they may be saved and at the very least, spend their remaining years as ambassadors for their kind at the Jack Miner sanctuary. It may be attributing thought to what is random behaviour and emotion to what is merely instinct, however, it is hard to discount the obvious that the geese care about each other. They seem to have empathy for the injured and they sacrifice their own safety for both the group and other individuals. The geese look out for each other. 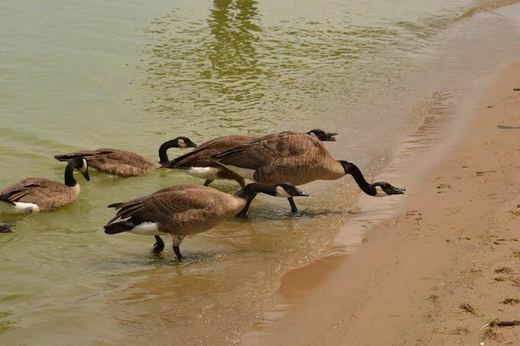 These geese exhibit attributes that people reserve for humans at a level that surpasses what most residents of Lakeshore reserve for wildlife. Lakeshore doesn't have a goose problem. Lakeshore has a people problem. Yesterday morning Bert was feeding with a large group of 11 geese and an eagle flew past. There was a panic flight to the water by the flock and Bert stumbled while running after them as he was dragging his injured wing. His injury was opened and he was obviously in pain so we bagged him and took him to the Windsor/Essex County Humane Society. Kyle took custody of Bert. The Humane Society "social worker" was very sympathetic when she explained to me that they were a charitable organization with a limited budget, that the vet would look at Bert, however his chances of getting surgery weren't good and that they may just put him down. I mentioned I was doing a story about Bert for kids and that wasn't the ending we were hoping for. I explained that Bert had friends at the oldest wildlife sanctuary in Canada that had promised to look after him once his wing was fixed. I could tell that they were caring people, however they advised us that they had no arrangements with Fish and Wildlife to take in injured geese and I could see they remained sceptical about Bert's future. Ernie was delivered safely to the Humane Society just as Bert was coming out of surgery. All involved went beyond what could ever have been expected in saving Bert. We had to get Ernie when he came looking for Bert this afternoon. The other geese were bullying him. The other geese had heard us catching Bert and instinctively knew Ernie was on his own. We walked Ernie into a hockey net and took him in. Ernie was not happy. What was odd is that the other group of geese didn't object and just watched. They were not even alarmed. Kathy was talking to one of the staff at the Society and they said with a smile, "That must be Ernie". The director at Jack Miner had emailed them my Bert & Ernie story. Mary told me she sent in the story so that the Vet would know Bert had been injured for some time and not to immediately put him down as he was suffering. They read the story and decided to operate on Bert that day. 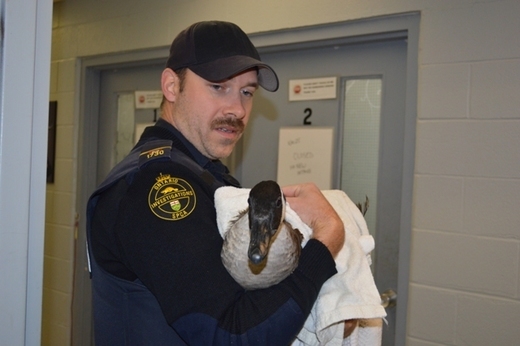 I am not sure how much of this story I can tell as it was unusual to save a goose. I can't say enough about everyone involved. Jack Miner has a vacancy in one of its enclosures so they can spring Bert early from the recovery cage and they will keep both birds together. Ernie will be in the cage next to Bert so they can talk when Bert comes around after surgery. Keeping them close is good as the barking dogs at the Humane Society will be very traumatizing for them. Three more flightless geese to go. Ernie at 4:16 yesterday afternoon.